great granny squared is here! My new quilt book has arrived! Here's Lori Holt's Great Granny Squared! In the book's introduction, Lori explains how this block is inspired by crocheted granny squares, and how it's the perfect way for thrifty quilters to use up every little scrap. The Great Granny Squared pays tribute to the creative women in our lives. Of course, if it's a Lori Holt pattern, then it must be fun, right? There was a Great Granny sew along a few years ago. I made a quilt for a colleague's baby boy, but I forgot to take a picture of the finished quilt (I know, I feel a little guilty). There are photos of the individual blocks on my Flickr page here. Looking at those blocks now, I'm stunned to see that I used fabrics way out of my comfort zone - orange?! aqua chevrons?! monkey prints?! And when that quilt was finished, I really wanted to remake it for myself. Well, Lori has compiled the pattern into her second book. It's a bright, colorful book, full of scrappy quilts and inspirational vintage-y photos. The original Great Granny Square is 12" finished. There are a few extra projects, including a runner with 6" blocks. 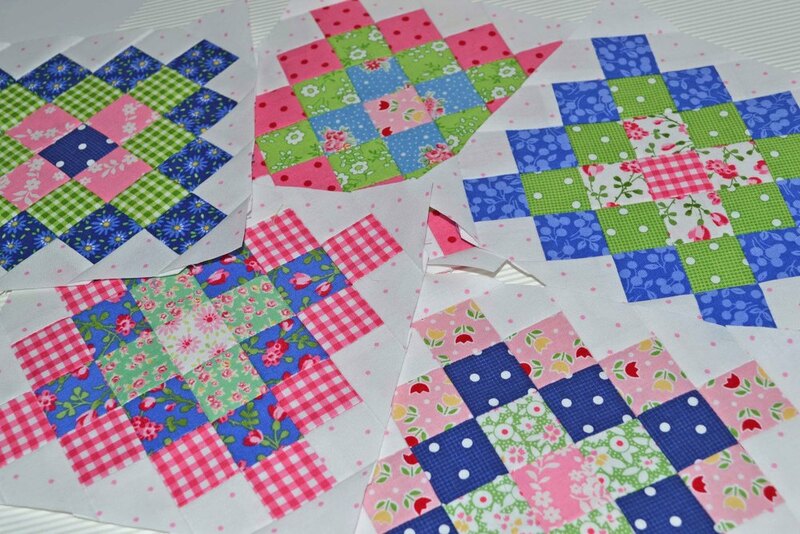 I decided that I need to make a whole quilt out of those little 6" blocks. I'm working with a deliberately controlled scrappy color palette, focusing mainly on deeper blues, bright pinks, kelly greens and a few whites for sparkle. My grandmother Frieda had a great love for life. Always cheerful and always wanting to make everybody feel welcome. She loved to crochet, usually with bright acrylic yarn. And her color sense was a bit... well, it was odd. Imagine a chevron crocheted throw in chocolate, burnt orange and mustard, and maybe a bit of leftover pastel pink thrown in, just because she liked it. Or how about orange, kelly green, white and pale blue? But then she made a simple, granny square throw that we all loved. It was deep blue, pink, green and white. I loved that thing! I spent my high school years snuggled under it, watching videos on MTV. There won't be any burnt orange or mustard!